ACTIVITY 77: Are there any glaciers or volcanoes in your country? Look carefully at the pictures below and try to choose the correct geographical feature from the menus. Then check the answers. ACTIVITY 78: Read this geographical description of Argentina. Then fill in the chart using information from the text. Finally check the alternative answers. Located in southern South America, Argentina (population: 33 million) is the second largest country on the continent and the eighth largest country in the world. Argentina is separated from Chile by the Andes mountain range in the west and south, the Chilean border measuring 5,150km.. It is also bordered by Paraguay and Bolivia in the north, and Brazil and Uruguay in the northeast, and Chile in the west and south. 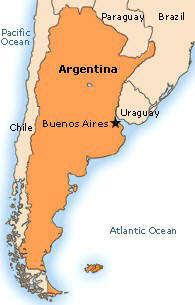 The capital city, Buenos Aires (population: 3 million), is located on the western bank of the Rio de la Plata. Buenos Aires is an important port city and Argentina is strategically situated along the great shipping lanes of the South Atlantic and Pacific Oceans. The terrain is made up of the rich plains of the Pampas are (among the most fertile in the world) in the northern half of the country, the relatively low-rolling plateau of Patagonia in the south and the rugged Andes range in west of Argentina. At a height of 6,960m, Cerro Aconcagua is not only the highest mount in Argentina, but also the Americas' highest mountain. The lowest area of elevation (-40m below sea level) is the Salinas Chicas, located on the Peninsula Valdes. Other natural features include Perito Moreno Glacier, Lago Argentino, Iguazu Waterfalls, and the Parana River. With a wide range of climatic zones, the Argentine climate is predominantly temperate with extremes ranging from subtropical in the north to arid and sub-Antarctic in the far south. The natural resources of Argentina include agricultural products (wine, fruit, cotton, wheat, corn, oats, barley, rice, sunflowers), cattle products (worldwide famous meat and beef), industrial products (cement, iron, steel, textiles) and mining products (coal, crude petroleum, natural gas, zinc, lead, silver, gold, copper, iron). Entretenida forma de aprender geografía, no?